Te Ahi Kā: The Fires of Occupation, photographer Martin Toft’s homage to tangata whenua of the middle and upper Whanganui River, is now officially on sale after a ceremonial blessing in Auckland on Wednesday. Representatives of Te Whānau o Mangapapapa and Ngā Uri O Tamahaki travelled from the Whanganui region to Auckland’s North Shore to bless and receive copies of the book, which was published in the UK and craft-printed in Poland. The ceremony at the warehouse of Publishers Distribution Limited in Northcote/Te Onewa ensures that this tribal taonga can be appropriately distributed via Oratia Books in New Zealand and Australia. The deluxe photobook celebrates a 20-year connection between the Danish photographer and the Whanganui iwi. In the mid-1990s Martin Toft spent six months living among Māori communities far up the Whanganui River, learning of their struggles to retain ancestral lands. Te Whānau O Mangapapapa and Ngā Uri O Tamahaki cemented the bond by giving him the Māori name Pouma Pokai-whenua. Twenty years later, Toft returned to complete his photo report. 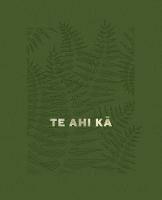 Te Ahi Kā: The Fires of Occupation records that interaction in photos, archival images, interviews and text — summarising the key political, environmental and cultural issues for the iwi. Published in the UK and distributed in New Zealand by Oratia, the sumptuous hardback features superb colour and black and white photographs (spanning 1885 to 2017), fold-out pages and alternate female (fern) and male (embers) cloth embossed covers. A pre-publication dummy version of the book was shortlisted for the Kassel Dummy Award in Germany in 2018. Māori and the author. It aims to leave a legacy for future guardians of the Whanganui, and to share the aspirations and desires of this unique community. Martin Toft is a photographer, photo book artist and educator who works on commissions and long-term collaborative projects. Born in Denmark in 1970, he has travelled widely and since 2004 has been based in Jersey, where he teaches photography at Hautlieu School. His work has been exhibited and awarded widely around the world.